Walk several dogs together without dislocating your shoulder! This is a great resource for any multi-dog home, whether you’re looking to introduce a new dog or wondering how to keep your current dogs from bowling you over when they run out the door. Are you concerned that there is tension between two of the dogs in your pack, and that your dog's play might escalate into aggression? Would you like all your dogs to lie down and stay while you eat your dinner, or to walk past a food wrapper in the street without snarfing it down or getting into a fight over it? This eBook provides the answers to those questions, along with clear and workable ideas to make living with a pack of dogs fun and fulfilling. Better Together! Order the Feeling Outnumbered DVD to see the techniques from the book in action with Trisha and a variety of dogs. As everyone with multiple dogs knows, having two dogs can be more than twice the fun (and work) of one. This eBook will give you the tools you need to manage your pack, by teaching them to get what they want by being polite rather than pushy. 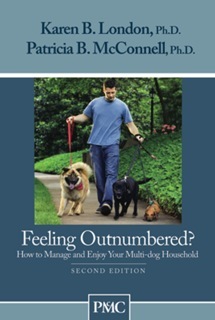 This is one of the few resources available that addresses the unique demands of a multi-dog household. Let it help you assist your clients when the situation gets “out of hand” (paw?). Busy foster homes can use some of the techniques in Feeling Outnumbered? to help them manage their ever-changing group of dogs. The sections on introducing new dogs and reading signs of potential aggression are especially useful for people bringing fosters into their homes. "This booklet is a life saver for anyone living with more than one dog!" in their home. It is simple, straightforward, and makes you feel as if you are in Patricia's home. highly recommend this book and DVD to anyone who has more than one dog." dealing with a chaotic household. Mine are now all lying in their "places,"